Bengaluru Bulls had a forgettable outing against Bengal Warriors on Saturday as they suffered their second straight loss to Surjeet Singh’s men after defeating them during their home leg. The only positives on the night for them were the disciplined performance of their defenders and the fiery raiding of young Harish Naik. Brought into the starting 7 after Ajay Kumar’s recent slump in form, Naik justified his inclusion by emerging as the highest scorer of the match with 11 points. His spirited display was the reason Bengaluru were able to make a match of the contest after captain Rohit Kumar failed to deliver. 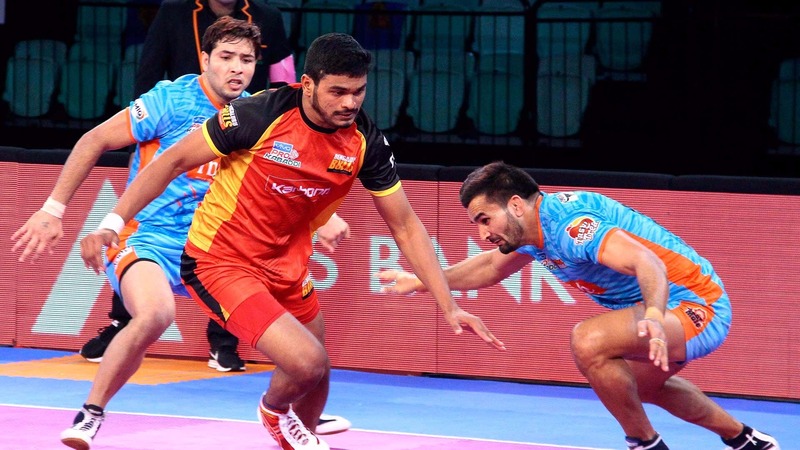 Naik and Ravinder Pahal were instrumental in the only All-Out the Bulls inflicted on the Warriors and if it were not for a last-minute super raid by Maninder Singh, the game could have gone the way of the Bulls. With their play-off hopes diminishing by the day, Bengaluru Bulls now look to youngsters like Naik to pull off the miracle for them.